The Wii Virtual Console springs back to life this week with two classic games from the fine folks at Sega, including one that never even made it stateside. Time for some old school action role-playing! Wonder Boy in Monster Land and Monster World IV hit the Wii Virtual Console today, giving owners of the console two excellent reasons to turn it on and figure out where the Wii remote got off to. A pair of action role-playing games, Wonder Boy in Monster Land for the Sega Master System is a bit like the second Legend of Zelda game, though this looks to be the arcade version of the game. 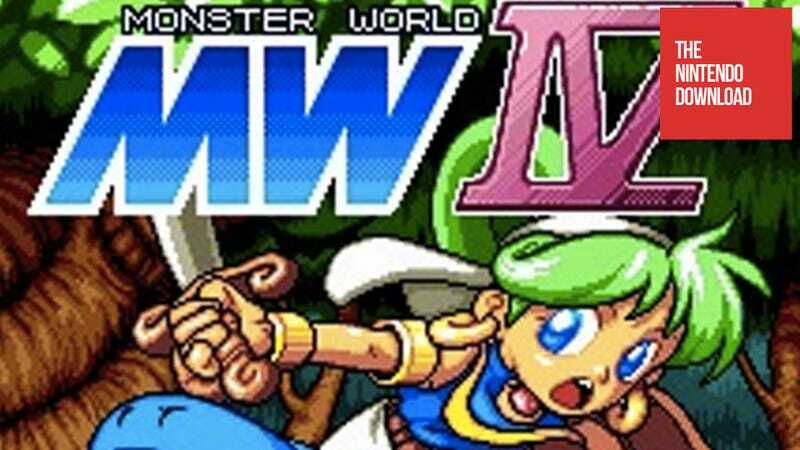 Monster World IV for the Mega Drive is the final game in the Wonder Boy / Monster World series. Seriously, where the hell did I put that Wii remote? The rest is, as it were, the rest. There's a Sudoku game for the 3DS, the sequel to a DSiWare shooter, and ooooo, more Dinosaur Office. The once-beautiful kingdom of Wonder Land has been thrown into chaos by a ferocious, fire-breathing dragon called MEKA dragon. The dragon and his monstrous henchmen conquer the peaceful world, turning it into Monster Land. Unable to defend themselves from the onslaught, the people cry out for a hero to save them. Wonder Boy sets out on and incredible journey across different environments and dungeons. He collects powerful weapons and spells to rid the land of the evil monsters and defeat the dragon! For the first time outside of Japan, experience the final chapter in the classic Monster World series! One day, a young, green-haired girl names Asha, hears spirits calling out for help. Upon hearing the spirits, she leaves her village and sets forth on a grand adventure into Monster World. One her journey, she comes across a small blue monster named Pepe and a magical Genie. Together they must fight through Monster Land to defeat evil and save the troubled Elemental Spirits. Paul and his twin brother join forces to smash the Insectians in this explosive sequel. The player controls Paul and his brother, twins of a super hero family who were born with innate super powers. The two brothers have the ability to take flight and attack with powerful projectile energy. However, most importantly, they are both gifted with the ability to take the form and seize the weaponry from fallen enemies. The Insectians have vowed revenge for their defeated ally – the Oceanians. Paul is once again summoned to fight an alien invasion force bent of retribution, but this time Paul is not alone. It's up to Paul and his twin brother to use their combined powers and weapons obtained from the aliens to fight back and smash the Insectians. "Sudoku by Nikoli" contains 50 sudoku puzzles. Sudoku is a puzzle in which you place numbers from 1 to 9 into a 9x9 grid, divided into horizontal and vertical lines and 3x3 blocks, filling up all of the spaces with the numbers. With everything from simple puzzles to super-difficult ones, this game is popular with a wide range of players, from beginners to veterans. To ensure your long-term enjoyment, we've prepared both a "Stage Clear" mode and a "Random" mode. In "Stage Clear" mode, you progress by clearing puzzles one by one, and in "Random" mode puzzles are generated at random. Please enjoy this high-quality sudoku game. An after-work party leads to a dinosaur cat fight.